The SEPECAT Jaguar is an Anglo-French jet ground attack aircraft still in service with several export customers, notably the Indian Air Force and the Royal Air Force of Oman. It was among the first major Anglo-French military aircraft programs. The aircraft served as one of the French Air Force's main strike/attack aircraft until 1 July 2005 (when it was replaced by Dassault Rafale) and with the Royal Air Force until the end of April 2007. The Jaguar program began in the early 1960s, in response to a British requirement (AST 362) for an advanced supersonic jet trainer to replace the Folland Gnat T1 and Hawker Hunter T7, and a French need for a cheap, subsonic dual role trainer and light attack aircraft with good short field performance to replace the Fouga Magister, Lockheed T-33 and Dassault Mystx�re IV. 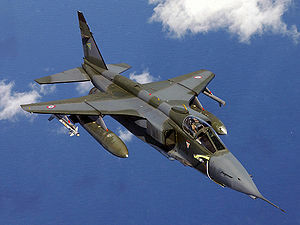 After development started, both the French and British trainer requirement changed and were eventually fulfilled instead by the Alpha Jet and Hawker Siddeley Hawk respectively. In the meantime, the RAF created a new requirement for the Jaguar, to replace the McDonnell Douglas Phantom FGR2 in the close air support, tactical reconnaissance and tactical strike roles. In addition, a carrier-capable version to replace the French Aeronavale's Dassault Etendard IV was specified. From these apparently disparate aims would come a single and entirely different aircraft: relatively high-tech, supersonic, and optimised for ground attack in a high-threat environment. Picture - No. 2 Sqn Jaguar GR.1s at RAF Wildenrath, Germany, in 1978. Cross-channel negotiations led to the formation of SEPECAT (Soci�t� Europ�enne de Production de l'Avion d'x�cole de Combat et d'Appui Tactique - the European company for the production of a combat trainer and tactical support aircraft) in 1966 as a joint venture between Br�guet-now Dassault Aviation-and the British Aircraft Corporation to produce the airframe, and a separate teaming of Rolls-Royce and Turbom�ca to develop the Adour afterburning turbofan engine. Though based in part on the Breguet Br.121, using the same basic configuration and an innovative French designed landing gear, the Jaguar as built also incorporated major elements designed by BAC - notably the wing and high lift devices. The first of eight prototypes flew on 8 September 1968. It was an orthodox single-seat, swept-wing, twin-engine design but with tall landing gear. It had a maximum take-off weight in the 15 tonne class and could manage a combat radius on internal fuel alone of 850 km (530 mi). Maximum speed was Mach 1.6 (Mach 1.1 at sea level) and hardpoints were fitted for an external weapons load of up to 10,000 lb (4,500 kg). Picture - RAF Jaguar GR3 during mid-air refueling. The aircraft has been updated several times and remains in front-line service with India and Oman. It has been replaced by the Eurofighter Typhoon in the RAF and the Rafale in the Arm�e de l'Air. India plans to replace its Jaguar fleet with the Medium Combat Aircraft (MCA) which is currently under development. Demands by the UK Treasury to cut the defence budget led to reports that the Jaguar was a possible candidate for early retirement. 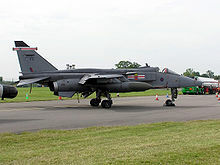 Announcing plans for the future of the British military on 21 July 2004, Defence Secretary Geoff Hoon detailed plans to withdraw the Jaguar by 2007. An expected date of October 2007 for the out of service date (OSD) was brought forward at just five days notice to 30 April 2007. Critics say the aircraft was near the end of its service life and did not have all the capabilities required of a front line jet. Proponents argued that the aircraft was recently updated and was the most cost effective of all the RAF's fast jet force. India on the other hand is modernizing its Jaguar fleet and also placed an order for 17 additional upgraded Jaguar aircraft from Hindustan Aeronautics in 1999 and a further 20 in 2001-2002. The Indian Air Force plans to upgrade up to 120 Jaguars by fitting more powerful engines, either Adour Mk821s or Honeywell F125IN to improve performance, particularly at medium altitudes. The Jaguar International (in common with the Lightning) has provision for overwing pylons. Mounted on the Jaguar they are used for short-range air-to-air missiles, such as the Matra R550 Magic or the AIM-9 Sidewinder. This option frees up the under-wing pylons for other weapons and stores. RAF Jaguars gained overwing pylons in the build up to Operation Granby in 1990, but French Jaguars were not modified. The RAF's Jaguar 97s were intended to be wired for the carriage of ASRAAMs on the overwing launchers, but clearance of this weapon was never completed due to funding cuts. The Arm�e de l'Air took delivery of the first production Jaguar in 1973, one of an eventual 160 single-seat Jaguar As. For type conversion training, France also took 40 of the two-seat Jaguar E. After Breguet was purchased by Dassault, the proposed Jaguar M variant, a carrier version for the French Aeronavale, was cancelled in favour of the Dassault Super Etendard. Picture - RAF Jaguar deployed in Operation Desert Shield. The RAF accepted delivery of the first of 165 single-seat Jaguar GR1s (or Jaguar S) with 54(F) squadron in 1974. These were supplemented by 35 two-seat trainers, the Jaguar T2 (or Jaguar B according to the manufacturer's designation). The Jaguar S and B had a more comprehensive nav/attack system than the A and E models used by the Arm�e de l'Air, and had the British Aden cannons installed instead of French DEFA cannons. Some RAF Jaguars were used for rapid deployment and regional reinforcement, operating with the Coltishall wing, and others flew in the nuclear strike role. The latter aircraft were the RAF's only single-seat strike platforms, and were later replaced by the Panavia Tornado. 20 Squadron and 31 Squadron also based at RAF Bruggen brought the RAF Jaguar force to its peak strength of six squadrons plus one war reserve 'Shadow Squadron', each of twelve aircraft equipped with eight WE.177 nuclear weapons. Two further squadrons, 2 Squadron and 41 Squadron based at RAF Laarbruch and RAF Coltishall respectively, were primarily tasked with tactical reconnaissance and not allocated nuclear weapons, although their aircraft could be rapidly configured for that. These Jaguar squadrons were all assigned to SACEUR, each with twelve Jaguar aircraft, eight WE.177 nuclear bombs, and a variety of conventional weapons. In a high-intensity European war their role was to support land forces on the Continent resisting an assault on Western Europe by the Warsaw Pact, by striking targets beyond the forward edge of the battlefield, first with conventional weapons and secondly with tactical nuclear weapons, should a conflict escalate to that stage. 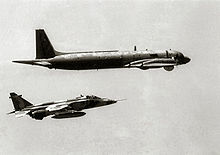 The apparent mismatch between aircraft numbers and nuclear bombs was a consequence of RAF staff planners concluding that there would be one-third attrition of Jaguars in an early conventional phase, leaving the survivors numerically strong enough to deliver the entire allocated stockpile of 56 nuclear bombs. Although targets were assigned by SACEUR, final political release of these nuclear weapons was in the control of the UK government. Picture - Three RAF Jaguars during Operation Northern Watch in September 1999. The RAF Jaguar force remained at this strength until late 1984, when 17 Squadron, 20 Squadron and 31 Squadron exchanged their Jaguars for Tornado GR1s, although their assignment to SACEUR and their wartime role remained unchanged. The two other RAF Germany units, 14 Squadron and 2 Squadron, followed suit in 1985 and 1989 respectively. The remaining Coltishall-based Jaguar squadrons continued flying the Jaguar for another two decades. The Shadow Squadron 226 OCU was renumbered 16 (Reserve) Squadron in 1992. Less well known than its peacetime function as a conversion training unit for aspiring Jaguar aircrew was 226 OCU's wartime emergency role as a 'shadow squadron' or reserve unit made up principally of the squadron's instructors. From 1975 the unit's wartime role was as an operational squadron in the front line assigned to SACEUR with twelve Jaguar aircraft, eight WE.177 nuclear bombs, and a variety of conventional weapons, identical in strength, equipment and role to operational front-line Jaguar squadrons. In December 1983 75 RAF Jaguars were updated to the GR1A and T2A standard with FIN1064 navigation and attack systems replacing the original NAVWASS. At about the same time, most were also re-engined with Adour 104 engines. In 1994, 10 GR1As and two T2As were upgraded with the capability to carry the TIALD laser designator pod and redesignated Jaguar GR1B or T2B respectively. The upgraded Jaguar GR3A (also known as Jaguar 97) introduced fleet-wide TIALD LDP compatibility, provision for the EO GP1 (JRP) digital reconnaissance pod, a helmet mounted sight, a glass cockpit with a large AMLCD display and a new HUD, a new hand controller and stick top, GPS, TERPROM Terrain Referenced Navigation, an Improved Data Modem datalink, and improved Night vision goggles compatibility. The interim GR3 (Jaguar 96) was delivered in three standards, for recce, attack and TIALD, but all were converted to Jaguar 97/GR3A standards. All GR3As were subsequently re-engined with the new Adour 106 turbofan. A number of T2 trainers were also upgraded to Jaguar 96 standard and redesignated Jaguar T4. One Jaguar was converted into the Jaguar Active Control Technology (ACT) with fly-by-wire controls and aerodynamic alterations to the airframe. The aerodynamic instability improved maneuverability and test data was used for the Eurofighter development. The RAF Jaguar aircraft flew their last operational sorties on 30 April 2007 when it ceased to be a deployable force element and when No.6 Squadron "down-declared", though flying continued. At least two aircraft continued to fly with QinetiQ at Boscombe Down after No.6 Squadron's withdrawal. On 20 December 2007, a Jaguar undertook the last ever British military Jaguar flight. Picture - Jaguar of the Indian Air Force during Cope Thunder exercise in Alaska. Jaguars were also sold to a number of overseas countries. The largest single customer was India which purchased about 38 of these aircraft and also acquired the license to manufacture 140 of them locally by Hindustan Aeronautics Limited under the local name Shamsher (after the persian word for Shamshir). The Jaguar International was an export version which was sold to Ecuador, Nigeria and Oman. 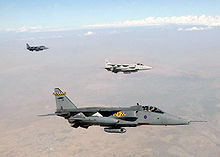 Oman's Jaguars have been brought to full GR3A standards and serve with No.s 8 and 20 Squadrons. The Jaguar saw combat during the first Gulf War of 1991, with the Arm�e de l'Air and RAF, the Balkan wars with the RAF, the Kosovo War with the Arm�e de l'Air and the Kargil War with the Indian Air Force. The Ecuadorian Air Force, the only Latin American export customer used them mainly for ground attack roles and occasionally for air superiority duties during the Cenepa War with Peru in 1995, but the main part of the fleet was held on reserve in case of a wider conflict with the Peruvians. Jaguar A Single-seat all-weather tactical strike, ground-attack fighter version for the French Air Force, two prototypes and 160 production aircraft built. Jaguar B / Jaguar T.Mk 2 Two-seat training version for the Royal Air Force, one prototype and 38 production aircraft built. Jaguar T2A Jaguar T2 upgrade similar to GR1A, 14 conversions from T2. Jaguar T2B two Jaguar T2A aircraft given TIALD capability. Jaguar T4 Jaguar T2A upgraded to Jaguar 96 standard. Jaguar E Two-seat training version for the French Air Force, two prototypes and 40 production aircraft built. Jaguar S / Jaguar GR1 Single-seat all-weather tactical strike, ground-attack fighter version for the Royal Air Force, 165 built. Jaguar GR1A Jaguar GR1 with navigation, chaff/flare, ECM and Sidewinder capability upgrades, 75 conversions from GR1. Picture - Sepecat Jaguar GR3A of 41 Sqn RAF, at Kemble Airfield, Gloucestershire, England. Jaguar GR.Mk 1B Ten GR1 aircraft modified to carry TIALD pods. Jaguar GR3 Jaguar 96 avionics upgrade to GR1A/B. Jaguar GR3A Jaguar 97 avionics upgrade to GR3. Jaguar M Single-seat naval strike prototype for the French Navy, one built. Jaguar Active Control Technology One Jaguar converted into a research aircraft. Jaguar International Export versions based on either the Jaguar S or Jaguar B.
Jaguar ES Export version of the Jaguar S for the Ecuadorian Air Force, 10 built. Jaguar EB Export version of the Jaguar B for the Ecuadorian Air Force, two built. Jaguar S(O) Export version of the Jaguar S for the Royal Air Force of Oman, 20 built. Jaguar B(O) Export version of the Jaguar B for the Royal Air Force of Oman, four built Jaguar IS Single-seat all-weather tactical strike, ground-attack fighter for the Indian Air Force, 35 built by BAe and 99 built by HAL (Shamser). Jaguar IB Two-seat training version for the Indian Air Force, three built by BAe and 29 built by HAL. Jaguar IM Single-seat maritime anti-shipping aircraft for the Indian Air Force. Fitted with Agave radar and capable of carrying Sea Eagle anti-ship missile, 12 built. Jaguar SN Export version of the Jaguar S for the Nigerian Air Force, 13 built Jaguar BN Export version of the Jaguar B for the Nigerian Air Force, five built. Picture - A Royal Air Force of Oman Jaguar S(O) intercepting an IL-38 in 1987. Picture - A twin-seat Jaguar EB of the Ecuadorian Air Force. Picture - The Rolls-Royce Turbomeca Adour Mk 102 turbofan engine. S�an, Wilson and Liam McBride. "Indian Jaguars: Still on the Prowl". Air International (Stamford, United Kingdom: Key Publishing), Volume 77, Issue No. 4, October 2009, pp. 66-71. ISSN 0306-5634. SEPECAT Jaguar Pictures and SEPECAT Jaguar for Sale.